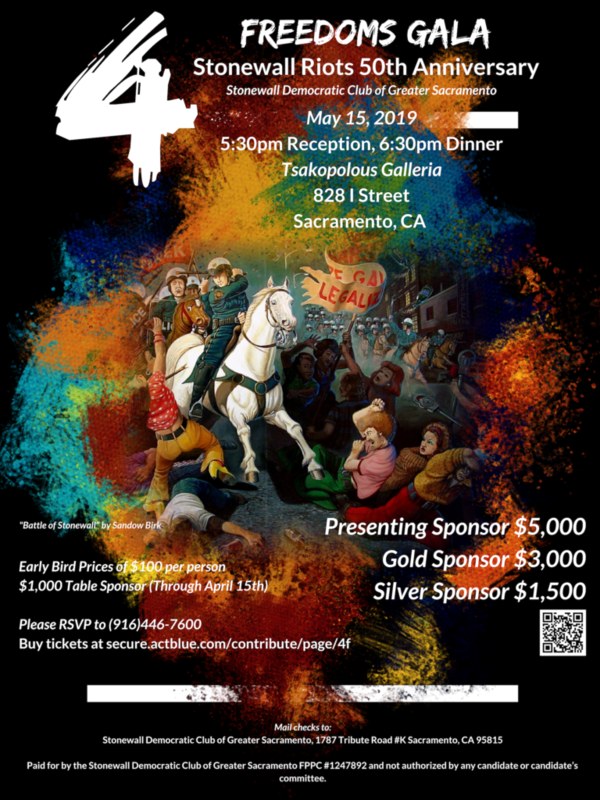 Stonewall’s 16th Annual Four Freedoms Awards Dinner will be held Wednesday May 15th at 5:30pm at the Tsakolpolous Galleria in downtown Sacramento. Tickets are on sale now! Early bird tickets are available through April 15th for $100 per person and $1,000 for a Table Sponsorship. Purchase here! Every year, the Sacramento Stonewall Democratic Club holds a gala where we recognize local leaders who embody the goals of the club and of the Democratic Party – freedom from fear and want, freedom of expression, and freedom of worship. The idea comes from Franklin Roosevelt’s Annual Address to Congress in 1941. For more information on President’s Roosevelt’s speech, please follow this link!